-- The Mountain Goats, "Teenage World"
The guy in the car studied finance and accounting in community college, and now he's got a job for the Methodist Hospital in Gettysburg, PA. The job doesn't yet actually involve finance or accounting even though it's in the hospital's finance and accounting office, but if he stays in the job long enough, if he gets a couple of promotions, it might. For now the job involves filing. It involves typing patients' first and last names and middle initials and their DOB and SSN onto little white sheets of paper and then sliding those little white sheets of paper inside the translucent yellow and orange and red plastic tabs at the top of pale blue file folders and then printing out pre-certification documentation and patient information forms and HSA reimbursement claims and then slipping them all inside the pale blue folders. He can think when he files, so he thinks about how he wants to learn to play the ukulele. He wants to learn "No Children" and "The Best Death Metal Band In Denton" and "Pink and Blue." He wants to be as cleverly unhinged, as boyishly sinister, as John Darnielle; he wants to be wry and erudite and unpredictable. He wants to learn about things like boxing and obscure metal bands and Roman emperors and vegans. He confessed all of this to his girlfriend Lindsey two weeks ago after he'd taken her to dinner at El Mariachi, and she just laughed at him. It wasn't the good kind of laughter. It wasn't friendly or understanding or sweet. It wasn't the kind of laughter that suggested she understood what he was trying to say, understood the real gravity of it, how frustrating and hopeless everything might feel to him and so she was laughing to try to lighten the mood. And she didn't follow the laughing with a confession of her own, admitting that for the first two years of high school she'd wanted to be Christina Aguilera or that her stepfather had once locked her in the bathroom for three hours because he'd caught her smoking his pot out by the air conditioner compressor fan behind the house. No, she'd just laughed, and he'd dropped her off at home and when she asked him what was wrong, he didn't even try to explain it. But she must have understood something because when he stopped over after work two days later she told him she had a present for him and she handed him the rabbit. It's for you, she said. He took it home with him and put it in an old dog crate someone had left in the garage behind the house where he was renting an apartment, but it didn't take him long to figure out he didn't want a rabbit. He didn't understand why Lindsey had thought he would want a rabbit and he didn't know what it had to do with what he'd told her about John Darnielle and then her laughing at him, but he just knew that all of it was somehow tied together, and he felt like he needed to understand it but couldn't, and so he'd taken the rabbit out of the dog crate and brought it with him in the car and now here he was just driving nowhere in particular and trying to concentrate, trying to get his head cleared and figure it all out, but the only words that kept appearing in his head weren't connected to one another in sentences but instead were just individual words jumbled together as if they were a thousand different colored bottles thrown into a recycling dumpster. But as he kept driving, as he passed the last of the buildings and parking lots and strip malls that looked even vaguely familiar, the words started to sound like something to him, not something that made sense but something pleasing, something that tasted good on his tongue. Oxygen jewel weed dexadrine. Tabulate easter ghetto. Indent wonder eliminate create. It's been several months now since I've missed a Sunday Mass. 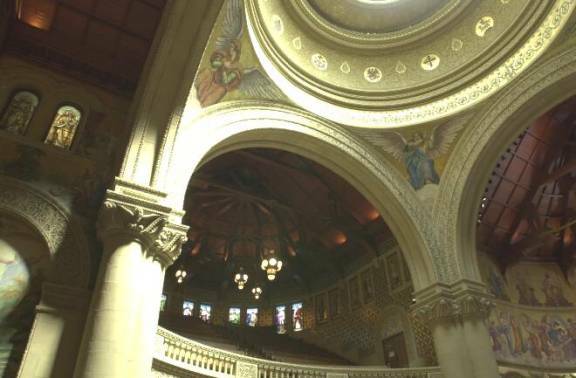 I go to a late night one, in a big California cathedral, and sit in the back with a clear view of the vaulted ceiling. We believe in one God, the Father, the Almighty, maker of Heaven and Earth, of all that is Seen and Unseen... I am un-baptized. I am unbelieving, or beginning to believe, or begging to believe, depending on the night. What I like is the bend of the bodies: the boys late and alone in the evening damp, clutching at crosses; the woman in glasses who sits the whole hour with her thumb to her forehead and her eyes closed; the small choir, their mouths open in apostrophe, their voices barely rising to the ceiling. I am learning all the prayers, the Our Father, the Hail Mary, the Nicene Creed. I say them all. I hear them all like static-y, distant stations on a bad Honda Radio, like a foreigner passing through a mountain town. I can only pick up, pick out, occasional lines to love: full of grace, forgive us our trespasses, come again in glory... come again. I've spent my whole life in the land of the faithful: of roadside crosses and Bible passages on billboards and honeysuckle climbing up over the walls of churches. I never belonged there, and only now, miles and miles West, am I going to church. My faith -- whatever, whenever it is -- is an act of translation: the literal into metaphor and then back again. The body into the word, the word back into the body, and that body somehow into mine: misshapen knee, copper curl, chin turned up toward the glass and the light. Lord, it is time. The great mass of students has gone by. The fruits have not yet begun to swell on tree and vine, but no matter: It's summer break. It is time for me to get lonely. It is time for me to return to writing, which means I've got to try, by some peculiarly plodding trick, by some bland and shadowless magic, to propel myself into that psychic place (a shipwrecked sailor on a verdant isle, a scrawny mouse in a crusty cupboard, a bright red shirtless bellyful retiree brandishing a metal-detector on some oil-slicked  Florida panhandle beach) where I can forage for the only foods that seem to effectively fuel my writing: melancholy, desolation, an autumnal quiet, an abiding loss. I do not want to be sad, not exactly -- and certainly not miserable. Sadness makes me quiet, an awkward scuttling of steps in a grand cathedral. And there is nothing at all to be said in the face of misery. One merely moans and then, finally mustering a voice, curses the world and everyone in it. Ah, but to get lonely. To get lonely is to feel oneself quietly, inexorably withdraw, to feel one's peripheral vision somehow widen, to feel that even the smallest sound -- the clink of ice, the tap of a pencil, the hum of a distant air conditioner -- contains a secret code, a talismanic signal. Forget waiting, like Rilke, for an Autumn Day. By then I've got books to choose, syllabi to prepare, meetings to attend. It is during the summer that I must press the final sweetness into the heavy wine, that I must wander along the boulevards, up and down, that I must somehow manage to get lonely.